Bringing country to town, for a whole week! ​Returning for its 3rd year, bringing country to town, Harvest Week celebrates everything country. Our aim is to attract local and visiting shoppers into Rangiora and to continue the momentum following the summer festivities. 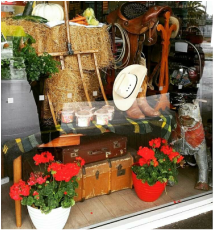 Visit the Harvest Displays around town and vote for your favourite on the Rangiora Promotions Facebook page. Quilter's Quarters, ANZ Bank, High Street Living, The Wool Shop, Toy World, Rangiora Library, Guthrie Bowron, Rangiora New World, ABC Rangiora Preschool, Southbrook Hire and Calder Electronics - Jaycar Authorised Stockist. Complete the Harvest Hunt and be in to WIN a lucky prize! During Harvest Week we have two Harvest Hunts for kids and their parents to participate in. So get your magnifying glasses out and venture into town to the participating businesses to tick off all items on your worksheet. Choose from either the Driving or the Walking Hunt. Or be enthusiastic and complete both! Good Street Deli, Monteiths and the ANZ Bank. Quilters Quarters, Guthrie Bowron and Artisan Bakery. During Harvest Week we encourage all businesses to join in on the fun and to come up with your own 'Harvest Week' activities or specials. To maximise this opportunity we will assist you with the promotion of any Harvest related promotions within your business - just let us know what you are planning. To celebrate Harvest Week in true 'country style' - we end up in Victoria Park at the week's end. ​Join us in the park for old fashioned games; pony rides; petting zoo; hay bales; produce market, stalls and country music.